Facebook Live isn't just for video. 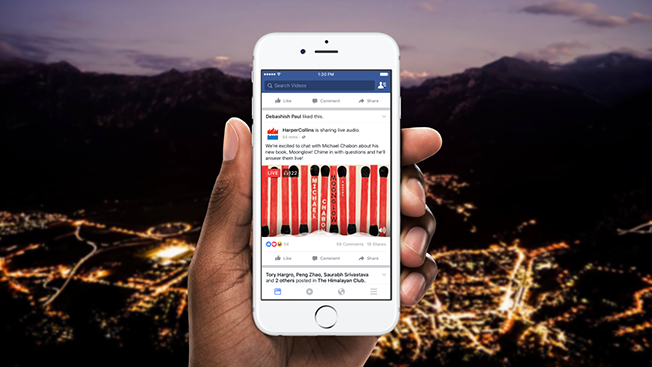 Today the social network launched a new feature dubbed Live Audio that lets users listen to broadcast voice recordings, pushing more audio-only content into newsfeeds. Facebook is heavily pitching Live Audio towards publishers and broadcasters who are already cranking out loads of live video to win over Facebook's algorithm that reaches a massive audience. A podcast or radio publisher may be able to livestream an episode straight from Facebook, for example. Or a news outlet could collect audio snippets from a live event. "We know that sometimes publishers want to tell a story on Facebook with words and not video," Facebook said in a statement. "We've even seen some Pages find creative ways to go live and reach audiences with audio only by using the Facebook Live API or by adding a still image to accompany their audio broadcast." According to Facebook, a handful of publishers and authors including BBC World Service, HarperCollins and Adam Grant are already on board with using Live Audio. The feature is beginning to roll out to a portion of its users and will be available to everyone next year.